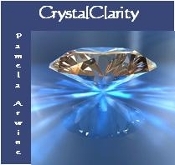 In 'Crystal Clarity' you learn to release toxic energies as you restore your energy bodies to original clarity and brightness. It is a full and complete, systematic exercise in which you learn the crucial steps of grounding, running energy, clearing, reclaiming power, calibrating the chakras and shielding. Never again will you be at the mercy of others' energies. Single CD. 70 min.